Prostaglandins may modulate intestinal tone and motility. Prostaglandin E2 causes contraction of longitudinal muscle and relaxes circular muscle, whereas prostaglandin F2α elicits contraction of both layers in in vitro studies. (l) Indomethacin, a potent inhibitor of prostaglandin synthesis,(2) would be expected to affect intestinal motility. In vitro studies show indomethacin relaxes the longitudinal muscle layer in response to a variety of stimuli,(3) and causes contraction of circular muscle. 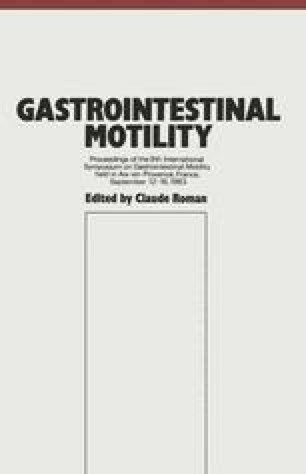 (4) Few studies have assessed the effects of indomethacin on in vivo gut motility. Mathias(5) reported indomethacin induced spiking activity and disrupted migrating action potential complexes stimulated by cholera toxin in anesthetized rabbits; Sanders(6) showed indomethacin increased luminal pressure in the ileum of anesthetized cats; Konturek(7) found that indomethacin caused diffuse spiking activity throughout the small intestine in conscious dogs. These in vivo studies suggest that indomethacin induces excitatory and contractile motility events and are consistent with in vitro effects of indomethacin on circular muscle reported above.